Pizza is one of the most widely consumed foods in westernized countries — especially in the United States. In fact, pizza is the 5th most common calorie source for all Americans ages 2 and up, making up an average of around 98 calories per day of the American diet. Unfortunately, these findings aren’t surprising when you consider how pizza can satisfy almost every craving and stimulate every aspect of your palate. With its saltiness, starchy dough, cheese, a bit of sweetness from the sauce, and whatever toppings you like, it is hard not to fall in love with pizza. The only problem is that pizza is so carbohydrate and calorie dense that it is one of the most obesogenic foods that you can eat. This means that pizza triggers a lot of the mechanisms that make us fat. However, if you want to lose weight, you don’t have to give up pizza entirely. In fact, you can eat pizza as a part of a healthy diet — you can even eat it while you are trying to get into ketosis. All you need is keto-friendly crust or low-carb dough, and you are good to go. To help you get started, we put together a list of our favorite low-carb, keto pizza recipes. 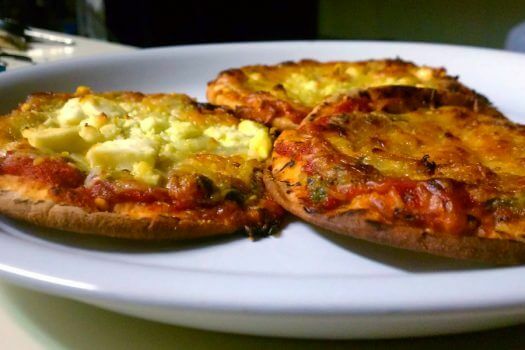 With these keto pizzas, you will never feel the need to have traditional pizza ever again. Below, you’ll find a list of each individual pizza and some information behind the health benefits of the recipe. Let’s get started with the simplest and quickest keto pizza you’ll ever make. Taste-wise, this is similar to a quality microwavable pizza. The psyllium husk fiber, bacon fat, Italian seasoning, cheese, basil, and tomato sauce come together perfectly to provide you with a satisfying personal pizza pie. The psyllium husk fiber, in particular, is what makes the keto pizza so much like actual pizza while making it healthier as well. For example, the psyllium husk fiber gives the pizza a whole wheat like texture while it provides the body with the fiber it needs to support healthy digestion, blood sugar levels, and cholesterol levels. To put it in another way, this pizza not only tastes like the real thing, but it improves your health as well. 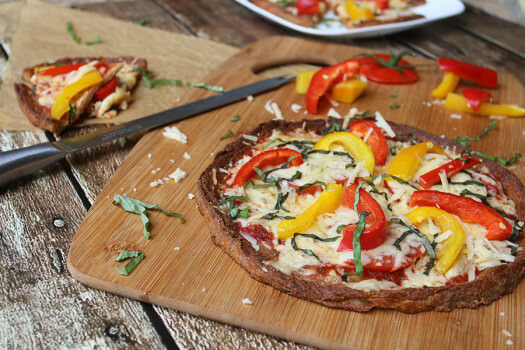 You can also easily adapt this pizza recipe to your flavor preferences and macronutrient needs. Need some extra fat and protein? Add some mozzarella and meat on top before you broil it in the oven. To keep the fat content high and the protein low, stick with high fat cheeses like mascarpone or cheddar and high fat meats like pepperoni. This is one of the best, most realistic, and sturdiest crusts I’ve found while on a ketogenic diet. It’s naturally crisp and crunchy, it holds together like a regular slice of pizza — and it tastes like the real thing. Although this recipe calls for pepperoni, feel free to replace it with any meats, cheeses, or sauces you’d like. Make sure you don’t forget to add some fatty meat though, it will take the flavor and nutrient density of your pizza to the next level. Meat, especially fatty red meat, is one of those keto foods that has a bad reputation. However, when you look at the research, it’s hard to justify calling meat an “unhealthy” food. In fact, meats and other animal products contain the most bioavailable nutrients that we can get in our diet. In other words, this means that the vitamins, minerals, proteins, and other health-promoting compounds that our bodies need for optimal health are typically found in much higher quantities in meat than in plant foods. Meat also contains different variations of these nutrients that tend to be used more efficiently by the body. 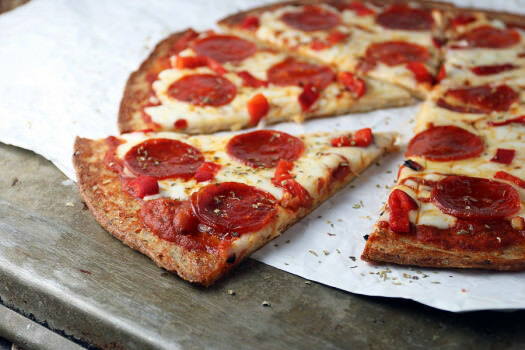 The pepperoni that you’ll use on this keto pepperoni pizza, for example, typically contains a mixture of beef and pork. Both will provide you with essential fats, complete protein, b vitamins, minerals, creatine (which is essential for many functions throughout the body), and the antioxidants glutathione and taurine. When you combine the pepperoni with the cream cheese and mozzarella cheese, you will get some of the most bioavailable nutrients and healthy fats in one delicious keto pizza. To increase the nutrient density and health benefits of your meats and cheese even further, consider ordering from US Wellness Meats (or any other sources of 100% grass-fed, humanely-raised animal products). They have 100% grass-fed, pasture-raised animal products that are much healthier for us and the environment. If you are craving a thin, crisp crust that requires little effort to prepare, then this pizza recipe is for you. 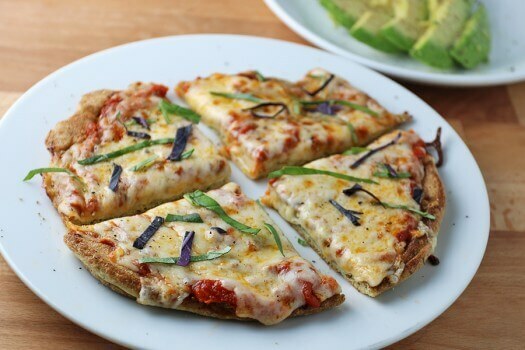 This keto pizza features low-carb pita bread that is the perfect replacement for traditional thin crust dough without any of the guilt. Once you have the low-carb pita bread, it’s up to you what you want to add to it. I find that the combination of Rao’s tomato sauce, mozzarella cheese, black pepper, garlic powder, and chili flakes really make this pizza pop. The best part about this keto pizza (as well as many other low-carb pizzas on in this recipe round-up) is that you can reap the benefits of tomatoes by using Rao’s tomato sauce. Tomatoes are the most common dietary source of the antioxidant lycopene, which has been linked to many health benefits including reduced risk of heart disease and cancer. Tomatoes are also an excellent source of vitamin C, potassium, folate, and vitamin K.
To top it all off, the mozzarella that you’ll be using in this recipe is a healthy staple pizza ingredient as well. It provides us with a good source of protein, mineral, vitamin, and conjugated linoleic acid (a fatty acid that helps improve metabolic health and decrease the risk of many diseases). To put it more simply, you can’t go wrong with a low-carb pizza that features tomato sauce and cheese. Unconventional, yet ridiculously delicious. 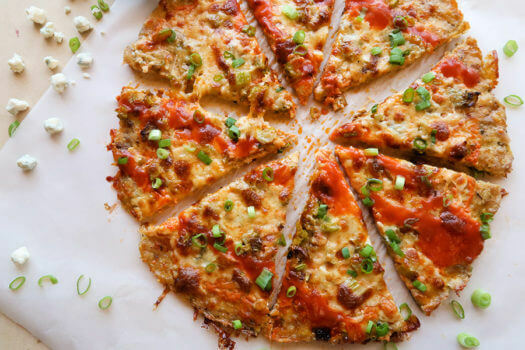 This keto pizza recipe is an excellent example of how you can turn the first recipe on this keto pizza recipe list into a pizza that you won’t find anywhere else. The combination of BBQ sauce and Rao’s tomato sauce provides you with the sweet and sour flavors that your palate craves. On top of that, the rotisserie chicken provides you with one of the best sources of protein and creatine of any meat. The protein will help you improve your body composition by preserving muscle mass and decreasing the number of calories you eat, while the creatine will boost exercise performance, enhance cognitive function, and improve energy levels. For some extra health-promoting fiber, substitute the cheese in the crust for coconut flour. If you want some extra fat instead, use the cheese in the crust and add some extra cheddar on top. Sometimes you don’t need any flour or psyllium fiber to make a delicious keto pizza. Take this recipe for example. All you will need is some meat, eggs, and a food processor — not for the toppings, but for the crust. Once you make the keto-friendly chicken pizza crust, you can top it with all of the buffalo chicken amenities (e.g., hot sauce, blue cheese, and celery). Not only are these ingredients delicious when eaten together, but they provide you with unique health benefits that you rarely get from keto pizzas. For example, the most common ingredient in hot sauce, cayenne pepper, improves circulation and digestive health, fights cold and flu viruses, and boosts metabolism. Meanwhile, the celery helps lower inflammation and cholesterol levels, while you get all of the benefits of calcium, protein, and healthy fats from the bleu cheese. Altogether, these three ingredients will satisfy your craving for something crunchy, spicy, and cheesy, while they help you meet your health goals. This is the ultimate low-carb pizza recipe for those who want to quell that pizza craving without so much prep and clean up. 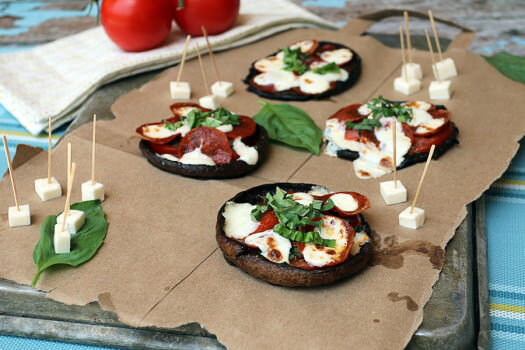 Just convert a big portobello mushroom into an edible plate for pizza goodness, and you are ready to indulge. As a side bonus, the portobello mushroom is a delivery mechanism for healing compounds that aren’t found in the plant kingdom. One of these beneficial compounds is known as L-ergothioneine (ERGO). Studies have found that people who have low levels of ERGO tend to have a higher risk for many chronic inflammatory diseases, especially those affecting red blood cells/hemoglobin. Research also shows that it may be helpful for counteracting damage to mitochondrial DNA and protecting against neurodegenerative diseases, especially Parkinson’s disease. Portabello mushrooms can also serve as an oil sponge that will soak up all of the deliciously healthy olive oil that you will use in this recipe. Not only will this help you meet your daily fat requirements, but it will provide you with a great source of monounsaturated fats and anti-inflammatory antioxidants. If you are looking for a keto-friendly vegetarian pizza option, then this recipe is for you. It is topped with red and yellow bell pepper that bring a fantastic crunch, sweetness, and a fresh aspect to every single bite. On top of that, you will get plenty of vitamin C and vitamin A from the bell peppers, especially the red variety. This will help boost your immune system, reduce the risk of cancer and heart disease, and improve the health of your eyes. The flavor and health benefits of bell pepper are further enhanced by the potency of the fresh basil, which has anti-inflammatory, anti-cancer, and anti-bacterial properties. The best part about this recipe is that it is customizable as well. If you are a meat lover, feel free to add bacon or pepperoni as it will really complement the flavor of the bell pepper and basil. Sometimes you need to experiment with something new. After a while, your palate may get bored of the same old variations of tomato sauce and cheese. This low-carb pizza recipe will give you those new flavors that you are craving on keto. Instead of tomato sauce, you’ll be using peanut sauce — and rather than pepperoni or peppers, you’ll be topping your pizza with peanuts, mung bean sprouts, and shredded carrots. 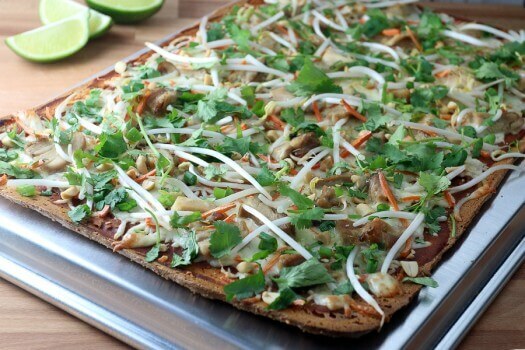 Not only is this Thai keto pizza delicious, but it also is a great way to get some healthy foods that you may not be using much of on the ketogenic diet like mung bean sprouts, carrots, and green onion as well. The mung bean sprouts will help you meet your daily needs for fiber, minerals like magnesium and zinc, and four of the eight b vitamins. In addition, the carrots provide you with some vitamin A and fiber, while the green onion provides you with allicin, a plant compound that activates anti-inflammatory and anti-oxidative activities throughout the body that protect us disease. Altogether this pizza is win-win for your taste buds and your health. Don’t forget to try this low-carb pizza out. For many, the combination of peanut and cheese is enough to put them off to the idea of Thai pizza. But what should they do if they want to try something a bit different? This apple and ham flatbread may be what they are looking for. Although this is known as a “flatbread”, you can think of it as a thin crust pizza — without the sauce. 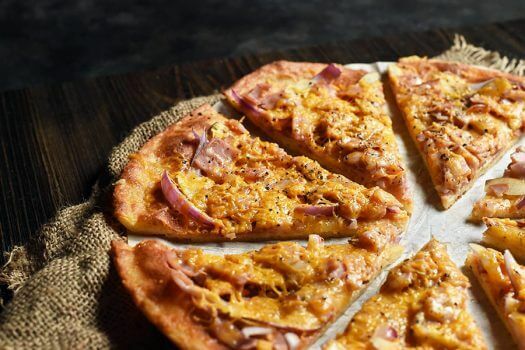 The combination of red onion, ham, and apple in this recipe is so sweet and savory that this may become your favorite low-carb pizza. Plus, this may be the only excuse you have to get the vitamin C, fiber, phytonutrients, and sweetness from apples into your meals while you are on the ketogenic diet. The red onions in this keto recipe also provide our bodies with many unique phytonutrients that protect our health. A particularly valuable flavonoid in onions is quercetin, which acts as an antioxidant that may help prevent cancer. Other important phytochemicals that are found in onions are disulfides, trisulfides, cepaene, and vinyldithiins, which are all helpful in maintaining good health with their anticancer and antimicrobial properties. 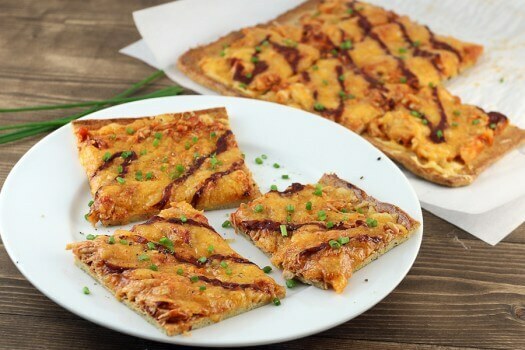 The combination of onions, apples, and ham makes this a healthy keto pizza that can be eaten as a snack or for lunch or dinner. In fact, it would even be a delicious breakfast — like the final keto pizza on our list. Waffles and pizza are delicious on their own, but what if you combine them — and make it keto-friendly? Pure deliciousness. In fact, the keto waffle makes a perfect delivery mechanism for any pizza toppings that you crave. Want scrambled eggs and bacon with some ketchup as the sauce? Or how about a bit of chicken, homemade BBQ sauce, and cheese? The possibilities are endless with these low-carb waffles. The waffle could be a healthy keto meal in itself because it is made up of a combination of eggs, almond flour, and psyllium husk powder. These three ingredients will provide you with a healthy amount of fiber, vitamins, minerals, healthy fats, and protein to help you power through the rest of your day without any cravings. Depending on your flavor preferences and macronutrient needs, feel free to experiment by topping these keto waffles with the ingredients you’ve read about throughout this post. Almost every keto-friendly ingredient can be adapted to make a delicious keto pizza waffle. Although I provide some suggestions on how to meet your macronutrient needs with some of these recipes, there are a couple of methods you can use on all of them. Add some high fat meats like pepperoni and bacon on top. Add a tablespoon of oil to the sauce. Add some extra meat (of your choice) to the pizza. Add some low-carb vegetables to the pizza. Check out our article on keto-friendly vegetables to find out what you can add to your next low-carb pizza. 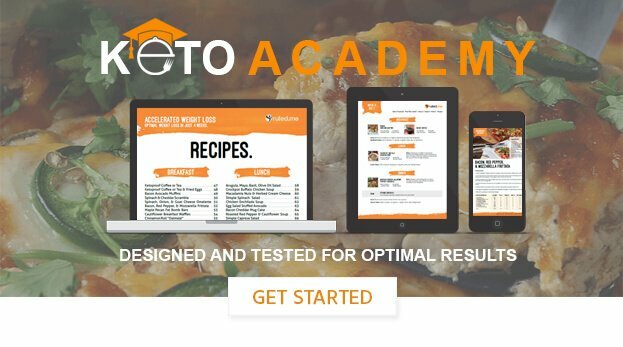 To find out what macros you need to eat to meet your goals, plug your information into our keto calculator. Not all pizza is unhealthy. In fact, all you need to do to make pizza healthy is remove the carb-ridden dough — and suddenly, pizza will take on a whole new meaning to your body. The options for low-carb, keto pizza are limitless. When it comes to crust, it can be cheese and egg-based, keto flour based, meat-based, or low-carb pita bread based. 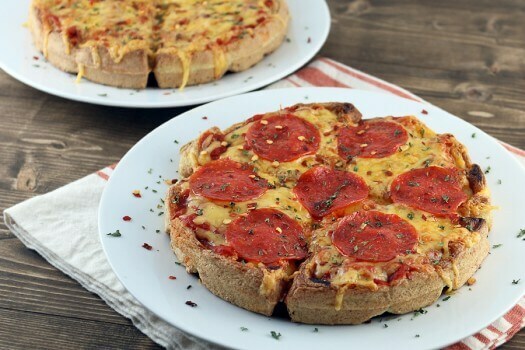 From there you can top your keto crust with anything you’d like (e.g., tomato sauce, BBQ sauce, hot sauce, low-vegetables, meat, cheese, etc.). Just mix and match, and you’ll be able to create a keto pizza that is better than the original.